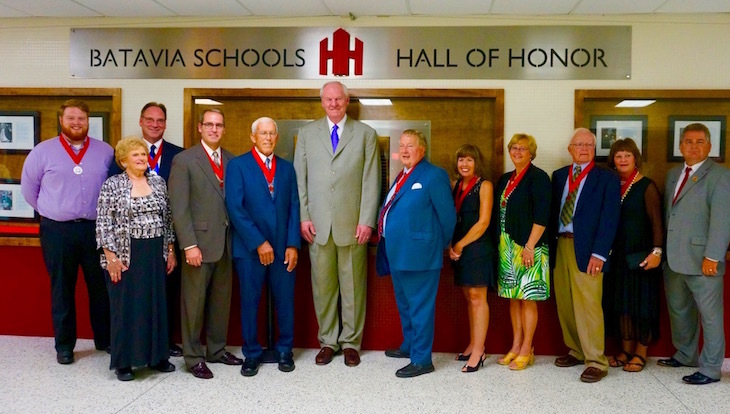 On Homecoming Night, Sat., Sept. 19, 2015, Batavia Public School District 101 welcomed 14 individual inductees into its inaugural Hall of Honor at Batavia High School. The BPS Hall of Honor was initiated by the Batavia Foundation for Educational Excellence and BPS101 to promote pride in Batavia Public Schools and to honor alumni, faculty, and friends who have made outstanding accomplishments in their communities and personal lives since they have been associated with District 101. The 2015 BPS Hall of Honor event was also a celebration of the Batavia Foundation’s 30th anniversary. Kenneth A. “Ken” Anderson (1967): Kenneth A. “Ken” Anderson was a playing member of the 1965, 1966, and 1967 Batavia High School basketball teams, which were undefeated in Little 7 Conference play. Anderson graduated from Augustana College where he was a starting quarterback on the Division III football team as well as a starter for the varsity basketball team for three years. In 1971, Anderson was drafted into the NFL by the Cincinnati Bengals, and became one of the most accurate short-range passers in the league. He was also the starting quarterback in Super Bowl XVI against the San Francisco 49ers. After playing professional football, Anderson went on to become a quarterbacks coach and offensive coordinator for the Cincinnati Bengals, wide receivers coach and quarterbacks coach for the Jacksonville Jaguars, and a quarterbacks coach for the Pittsburgh Steelers. In addition, Anderson earned a law degree from Northern Kentucky University. He and his wife, Cristy, currently live in Hilton Head, S.C.
Robert A. “Bob” Dahlstrom (1957): The son of Swedish immigrants who settled in Batavia in 1907, Robert A. “Bob” Dahlstrom, attended Batavia Public Schools from grades K-12. During his school years, Dahlstrom helped his father with the family dairy farm. In 1958, Dahlstrom was asked by his mailman if he’d like to be a postal sub, which turned into a rural mail carrier job that lasted 41 years. In 1962, Dahlstrom joined the Army Reserves and served on weekends and in summer camps until July 1968. He married Lois Downen, a 1964 graduate of Batavia High School. The couple’s two daughters, Amy and Brenda, are also BHS grads. A pillar of Batavia, Dahlstrom is an active volunteer at The Batavia Plain Dirt Gardeners, Faith Christian Academy in Geneva, and his church, Christ Community in St. Charles. Since retiring from the post office, Dahlstrom started a business titled, “What about Bob?” Through this business, Dahlstrom provides snowplowing and lawn maintenance for community members and says his greatest pleasure is helping people whenever and however he can. An avid gardener, Dahlstrom also supplies neighbors and local businesses with fresh flowers and vegetables, and has hosted several Batavia Garden Walks along with his wife, Lois. James L. “Jim” Hanson (1943): In 1955, after teaching English and History in Florida, James L. “Jim” Hanson moved back to Batavia and took a position as a junior high school teacher in the West Aurora School District. Later in his career, he served three terms as the Kane County Regional School Superintendent, was elected alderman in 1961. He served as a Batavia alderman for 16 years. Hanson also served as the chair of Batavia’s Planning, Zoning and Annexation Committee and on the Board of the Batavia Historical Society. In 2013, Hanson was honored by the Batavia Chamber of Commerce as Citizen of the Year. Daniel P. “Dan” Issel (1966): An All-American basketball player at Batavia High School (one of only two players at BHS to have a number retired), Daniel P. “Dan” Issel went on to become a two-time All-American basketball player at University of Kentucky. Issel was drafted into the American Basketball Association by the Kentucky Colonels, and was named Rookie of the Year in 1970. In 1971, he was named ABA’s All-Star Game Most Valuable Player. His career points total remains the highest among University of Kentucky men’s players. Issel was in the ABA for six years playing in six All-Star games, and was later traded to the Denver Nuggets, where he played for an additional nine years. Right after retiring from his 1984-1985 season, Issel received the NBA’s J. Walter Kennedy Citizenship Award for his outstanding service to the community. In 1993, Issel was elected into the Naismith Memorial Basketball Hall of Fame. Donald E. Kramer (1976): For more than 30 years, Donald E. Kramer has served Batavia and Kane County as a deputy, sergeant, lieutenant, and sheriff. Kramer is also the past president of the Geneva Rotary Club (named Rotarian of the year in 2003), deacon of Fox Valley Presbyterian Church, participant of Rebuilding Aurora, member of Geneva Academic Foundation, distinguished alumnus from Waubonsee Community College, and past president of Triad (police, elder services, and seniors). For the last ten years, Kramer has helped secure vocational opportunities and scholarships for high school students and taught a multitude of Kane County youth how to drive safely. Kramer remains the Batavia High School record holder for shot put (56 feet, one inch) after more than 35 years. Robert F. “Bob” Peterson (1948): After graduating from Purdue University, Robert F. “Bob” Peterson successfully ran his family-owned business, Batavia Foundry, employing many workers and contributing to the economic growth of the city. A lifelong resident and supporter of Batavia, Peterson was also a Batavia Public School District 101 Board Member for 15 years, president of the Board for seven years, and was named Batavia Citizen of Year in 2011, along with his wife, Suzanne, who is also a BHS graduate. Peterson is currently an active member of the Hansen/Furnas Foundation, Batavia Historical Society, and Batavia United Methodist Church, and delivers Meals on Wheels to the home-bound. James J. “Jim” Roberts (1976): Social Studies teacher and basketball coach at Batavia High School for 27 years, James J. “Jim” Roberts had a team record of 455 wins and 267 losses. In addition to this phenomenal win-loss record under Roberts’ leadership, the BHS Boys Basketball program earned 10 conference championships, nine regional championships, two sectional championships, one super-sectional title, two super-sectional appearances, and one Elite 8 appearance. Roberts was also responsible for instituting special events associated with the Batavia Boys Basketball program, including The Famous Sleeve Uniforms, the Wild Bunch Cheering Section, and the Night of Hoops Shootout, which has brought many of the top teams and most highly respected programs in the state of Illinois to play at Batavia. Roberts was inducted into the Illinois Basketball Coaches Hall of Fame in 2011 and retired from BPS101 in 2013. He currently resides in Batavia with his wife, Sylvia. Craig G. Sager (1969): In a world of 7-footers dressed in the latest fashions from the hottest designers, Craig G. Sager still manages to find a way to stand out from the crowd. A graduate of Northwestern University, Sager is known as “America’s Sideline Reporter,” and from his courtside perch at NBA and now NCAA Tournament games, he carefully and skillfully asks all the right questions in the heat of the moment. Sager joined Turner Broadcasting System in March of 1981 and soon solidified his reputation as an NBA insider. Now in his 34th season with the cable giant, his in-game interviews are well-crafted if not always well-received, and he is considered one of the best in the business when he must go off-the-cuff. While he is widely recognized in basketball for his NBA work, Sager has also covered USA Basketball during the FIBA World Championships, Pan-American Games, and Summer Olympics. Sager has covered the World Series, NFL football, Notre Dame football, college bowl games, tennis, skiing, and golf. He is also a featured voice on the NBA2K video series, proving that he is capable in any arena of sport. Before joining Turner Sports, Sager co-anchored CNN Sports Tonight and was the recipient of a CableACE Award in 1985. Sager began his career as a reporter for WXLT in Sarasota, Florida. He famously interviewed Hank Aaron as he rounded third after swatting his 715th home run. Jeffery D. “Jeff” Schielke (1967): Jeffery D. “Jeff” Schielke is a 6th-generation resident of Batavia, Ill., and the longest-serving mayor in Batavia history, currently serving his 35th consecutive year. He has served as chairman of the Kane County Council of Mayors since 1985. In 1996, Mayor Schielke began service as chairman of the Chicago Area Transportation Study Executive Council of Mayors for the six county metropolitan region, which surrounds and includes the City of Chicago. In 1999, Mayor Schielke was chosen to assume the position as vice chairman of the Chicago Area Transportation Study Policy Committee. In 2002, Mayor Schielke was appointed a Director of PACE. For a one-year term running from 2007-2008, Mayor Schielke served as Chairman of the Metropolitan Mayor’s Caucus, an organization of which he is a founding member. He was also chairman of the committee that wrote the original student government constitution at Waubonsee Community College, where he enrolled in the fall of 1967. Having been involved with the Batavia High School yearbook and student newspaper, he was similarly responsible for starting the Waubonsee student newspaper, Insight, which still flourishes today. After Waubonsee, Schielke enrolled at Aurora University. Following active duty in the National Guard and his eight-year-long role as a reporter and editor for the Batavia Herald, he earned his bachelor’s degree. Meanwhile, his interest in politics led him to run for mayor of Batavia — a position he has held since 1981. In 2005 Mayor Schielke was named “Citizen of the Year” by the community, which is the first time the award has been given to a person while holding public office. Schielke lives in Batavia with his wife, Linda Anderson, who is a retired assistant superintendent of schools in Bloomingdale, Ill.
Timothy L. “Tim” Schmitz (1984): Timothy L. “Tim” Schmitz is a fourth-generation resident of Batavia. He follows a long line of family members who attended Batavia High. Schmitz served on the Batavia Plan Commission, as an alderman and was a policy analyst for the Illinois House of Representatives. He received his dual degree in Public Administration and Political Science from Augustana College in 1988 where he met his wife, Julianne. The couple resides in Batavia with their children, Alex (Augustana College) and Ryan (Loyola University). Schmitz remains a Batavia paid-on-call firefighter and emergency medical technician, a position he has held since 1984. He is a recipient of the Red Cross’ Hometown Heroes Award and in 2005 was also honored to receive the Batavia Fireman of the Year award. Elected to the Illinois House of Representatives in 1999, Schmitz was one of the youngest elected members. He quickly progressed through the ranks by joining the leadership team as assistant republican leader from 2002-2009. In 2009, Schmitz was appointed deputy republican leader. After 16 years of service, Schmitz retired from the Illinois General Assembly in January of 2015. Lisa M. Palese: With over 22 years of service as a special education teacher at H.C. Storm and Rotolo Middle School and four years as a Special Education Administrator, Lisa M. Palese is currently the Director of Student Services and Homeless Liaison. Palese is a student-centered leader who works hard to meet the needs of all students. Her work as a teacher and leader within BPS101 highlights her commitment to students in need, especially homeless students and those with special needs. Through her position and work with the Batavia Special Needs Parent Group and CHIP IN Batavia, Palese has impacted countless students. In addition to her service to Batavia Public Schools and the community, she and her husband (Scott) raise their family of four (Lexie, Jake, Ashley, and Amanda) in neighboring Geneva. Marilyn G. Robinson (deceased 2010): For 22 years, Marilyn G. Robinson taught Business Education at Batavia High School. Following her retirement in 1988, Robinson served as secretary to the Batavia Foundation for Educational Excellence and was as a volunteer historian for the Batavia Historical Society and member of its Board of Directors. Robinson also coordinated the Batavia Public Library’s Writers Workshop for 17 years, helping a number of fledgling authors get their works published. Her many freelance writing projects included historical columns for the Windmill Herald, a Batavia newspaper. After the Windmill Herald ceased publication, Robinson wrote weekly historical columns for the Kane County Chronicle for four years. In 1989, she wrote Little Town in a Big Woods, a children’s history of Batavia, now in its third edition. BPS101 teachers use the book today in their classrooms. Robinson has written several other local history books, including The Sidewalks of Elburn. For her many contributions to Batavia she was named Citizen of the Year in 1995. Leslie G. “Les” Hodge (deceased 1999): Born in Waltonville, Ill., Leslie G. “Les” Hodge served as a U.S. Air Force staff sergeant during World War II in the South Pacific and was a volunteer firefighter with the Batavia Fire Department for 16 years, retiring as a lieutenant in 1970. In 1989, Hodge retired as a plant manager after working 43 years at Dunbar Kapple manufacturing. During his time at Dunbar Kapple, Hodge volunteered to cover a game for a local paper. He had no idea then that he would become a sports legend and that his sports writing would last 41 years. Hodge covered an estimated 10,000-plus sporting events for the Batavia Herald and the Kane County Chronicle, wrote more than 2,000 “Bulldog Beat” columns, and was a founding member of the Batavia Athletics Booster Club. He covered many local athletes who went on to professional careers, including Dan Issel and Ken Anderson. Hodge interviewed world-class athletes such as Chicago Cub Hall of Famer Billy Williams and Olympic marathon champion Joan Benoit Samuelson. In 1989, Hodge was inducted into the Illinois Basketball Coaches Hall of Fame for his work as a tri-city high school basketball writer. In addition, Hodge announced track and field meets, hosted a Saturday morning weekly sports talk show that covered all sports throughout the Fox Valley, and provided color commentary for Bulldog basketball games on AM1480 (formerly WGSB). The “Les Hodge Track and Field Meet” is named in his honor and is still a current event. Hodge and his wife, Melba, raised four Batavia High School graduates: Janis Graffagna (1974), Gerald Hodge (1977), Gregg Hodge (1979), and Sandra Wagner (1982). Gene A. Tyrer (deceased 1992): Gene A. Tyrer spent nearly a decade on the BPS101 Board of Education, starting in 1980. Born in 1927 and a child of the Great Depression, the St. Louis native was a graduating valedictorian from the University of Missouri before becoming a chemical engineer. In 1971, Tyrer earned a U.S. patent for co-inventing fireproof electrical cable, which ensures constant power to smoke alarms, exhaust fans and emergency lighting, among other uses. One year later, Tyrer and his wife Sharon (Morris) came to Batavia with high school daughter Debbie (Campbell), 7th-grade daughter Julie (Birkeneder), 4th-grade son Tom, and toddler Amy (Nelson). During his time on the Board of Education, Tyrer helped raise community awareness and political support for bond issues to create Rotolo Middle School and expand H.C. Storm, Louise White, and J.B. Nelson elementary schools, while also creating Batavia’s first anti-drug and alcohol awareness programs. Tyrer spent his latter career as a vice president for Gary-Wheaton Bank of Batavia (currently J.P. Morgan Chase). During his final days, he created a scholarship program for students interested in learning a trade.